What is the Colorado HS league? The Colorado High School Cycling League is an independent 501(c)3 Interscholastic Cycling Association (NICA). NICA is a national governing body for grades 9-12 interscholastic cross-country mountain biking. NICA launched the coast-to-coast movement in 2009 and aims to have coast-to-coast mountain biking by 2020. As of 2015, NICA leagues are established in Colorado, NorCal, SoCal, Utah, Texas, Minnesota, New York, Tennessee, Arizona, Georgia, Wisconsin, Alabama, Virginia, Idaho, and Nevada. Devo is the supporting organization for both High School teams in Durango – AHS and DHS. Who are the coaches? Head coaches this year will be Ashley Carruth and Tina Hott. All coaches are First Aid and CPR certified. Most Devo coaches have PMBI Coaching Certifications, and all are experienced riders and racers who have a passion for sharing their love of riding bikes! What can I expect at practices: Practices will be from 4:15-6:15pm on Tuesday and Thursdays, meeting at the Rec center. We will split into 2-3 groups based upon grade level or ability level. Both high schools will practice together. Boys and girls will practice together, but some practices we will mix it up and have them practice separately. Please, to maintain good team camaraderie and make sure practices are about the riders, no parent riders. 3. Rider must be race ready – participation waivers received. Parents at Races: Each team is expected to bring volunteers to the race. This is a great time to volunteer AND get to watch your racer on course. It’s an all-around fun family event, and parents are a big part of that! Volunteer information and race information will go out one week prior to each race. Per NICA rules, no parents on pre-ride or in the feed-zone. There are close to 350 racers and 75 coaches at these events. It makes life much easier for everyone if we can keep the course and feed-zone less crowded. But, coaches know that we have some parents who love to ride! We can help parents find times and/or places to ride your bike. Also, the job of “roaming marshall” and “sweep” are all done on a bike (search for these in the volunteer options). Vans: Due to the popularity of the HS league locally, we are going to need some help getting kids to races! It’s a relief that Devo has two vans of our own this year, but with so many athletes competing there will be limited space. Collectively, the two vans seat about 26 athletes, so priority will go to Seniors, then Juniors, and Sophomores, then Freshman. We will ask for a rsvp for a seat in the van one week prior to each race. It’d be great if parents who are driving are able to take some kids up to the race with them. Just to be clear, once you reserve a seat in the van, you are responsible to pay for that seat (all Devo charges is gas based upon how many are in the van, plus a small maintenance fee to keep the vans up and running). Due to limited space, no parents will ride in the van. Lodging: Depending on the venue, Devo will either camp together or stay in a team house for the weekend. This is a fun time for the team to hang out together and with the coaches. While we ask that the team lodges/camps together, we are not going to enforce that as we understand that each family has different ways of racing, traveling, and being together. Once again, we’ll need a head count one week prior in order to give an estimated price for lodging. The cost of lodging becomes cheaper with more people to split up the cost. Once you rsvp, you are responsible for that charge as last minute cancellations cause Devo to eat the cost, which we’d ideally like to avoid. Under some circumstances, group camping will be available (parents too!). Food: Each venue will be different. When we are lodging in a house, we’ll have access to a kitchen, so the coaches will cook dinner and breakfast. We always have gluten-free and veggie options. Plan on $5-$6 per meal. I will also need a head count one week prior. Plan on bringing snacks and lunch food with you. The camping races, we will ask for a parent to cook/plan a meal or we may go out. Projected Racer budget for this season if they attend all races and lodge with the team (not including equipment). Devo Registration $400 (includes a jersey, worth $50). For more information, contact Ashley Carruth at ashleycarruth@gmail.com. 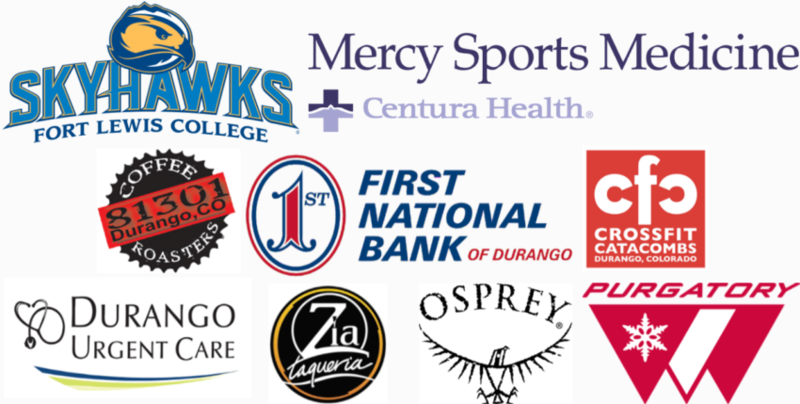 Thanks to our sponsors that make Durango’s High School teams possible!